But now, OMG!, the governments of the western world are running out of freebies. They can no longer sustain the promise of “vote for me and I’ll give you something for nothing”. Instead, these governments must now either 1) raise taxes; or 2) cut benefits; or 3) both. The public, long addicted to their “right” to something for nothing (“entitlements”), are having none of it. They want their free benefits, and they want ’em NOW! And, by God, you damn politicians better find a way to cough up more freebies, or the people will burn your damn cities to the ground! The stuff is beginning to hit the fan. The public, addicted to decades or political lies and monetary illusions, want nothing to do with reality (no free lunch; you must pay for what you get). But reality (a/k/a truth) is nevertheless rearing it’s ugly head and probably can’t be suppressed much longer. Our politicians can no longer protect us from the sad truth: no free lunch. In short, western governments are running out of their most important product: credible lies. People aren’t buying what governments are selling. Western nations (addicted to lies) are therefore starting to riot. You can bet that videos (like the following) that show European riots must strike real fear into the hearts of every western politician and globalist. I can guarantee that Prince Charles and Camilla–after their recent limo-rocking confrontation with rioters–are terrified by these kinds of videos. We can only wonder how long before similar riots begin in the USA. It’s possible that so long as the Federal Reserve can continue to inject hundreds of billions of unearned fiat dollars (something for nothing) into the economy, we may not see US riots. But–if the Fed loses it’s magical ability to seemingly “spin money out of thin air”–or–if the fiat currency’s value falls to hyper-inflation–the American people will turn on the government like a pack of entitlement-starved dogs. Watch to see if the European riots persist and grow, or if they tend to peter out. If the riots diminish, the system might be able to survive. 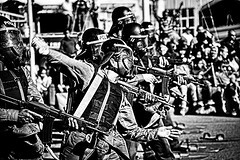 If the riots continue, they are almost certain to grow, governments will become openly oppressive, and one or more shooting revolutions may occur. 1. I wonder if any of these people are also just pissed off at their governments and using this as an excuse to vent. 2. Americans are rapidly losing their freedoms due to the FAKE war on terror. While I would NOT be one to encourage such a thing, I wonder why Americans are NOT behaving like this at American airports. Instead, Americans are allowing themselves to be gate raped at American airports and NOT coming to the aid of those who refuse to be gate raped by citing the Fourth Amendment. 3. Excellent sound track. “Requiem for A Dream” is one of my favorite songs. look as if the rioters are as unprincipled as their leaders.